Romanian traditional and international cuisine restaurant situated downtown Bucharest, very close to Universitate Square. 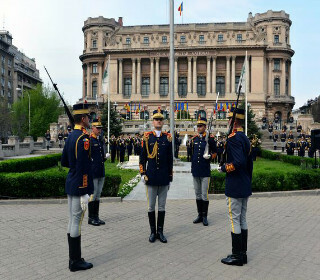 The building hosting the restuarant and imposing terrace belongs to Romanian Army. Locals in Bucharest have reviewd National Military Circle Romanian traditional in Bucharest. You can find here description, reviews, address, map, phone, website of National Military Circle Romanian traditional in Bucharest. Visit Bucharest Tips for more Romanian traditional restaurants in Bucharest!